-Make a model. This will be helpful for you and them. -Cut craft sticks into relatively uniform small, medium, and large pieces (for the distal, intermediate, and proximal phalanges). You will need to make 5 small, 4 medium, and 5 large for each participant–but it is very helpful to have extras, as craft stick pieces break easily. -Cut paint paddles into three pieces for the wrist bones (as shown in the picture to the right). The original instructions say to “cut the paddle in half, then cut one of the halves into two pieces, with one piece ~1″ shorter than the other.” You will need to make three pieces per participant. -Separate all the necessary “phalanges” (pieces of craft sticks), “metacarpals” (whole craft sticks), “wrist bones” (pieces of paint paddle), “flexor tendons” (string/twine/yarn), straws, and pony beads into a Ziploc baggie. Make up 1 baggie per participant. -If you have extra “phalanges” (which we recommend making! ), separate them into labeled baggies. -Print out Fingers of the Hand Instructions. One of the best explanations of how our bones are structured (as well as many other interesting facts about our bones!) can be found at KidsHealth.org.There is good information about the number of bones and names of the bones on the Women and Children’s Health Network website. While explaining the different bones in the hand, we found it helpful to project this image from Science For Kids. We told them that our flexor tendons help us flex our fingers, whereas our extensor tendons help us extend our fingers back out. Hopefully it was a useful mnemonic device! If they finish building all 5 fingers, do all of the necessary hot gluing for them! Nothing. This worked very well as-is. Many of the participants even finished their hands within the time allotted! Would not recommend for a younger audience (we think the project would be too difficult and/or tedious). Could be done with an older group, perhaps in conjunction with building other fake body parts (e.g. eyes, lungs, hearts). 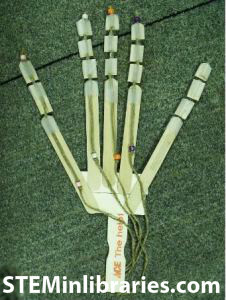 Modified instructions for “Fingers of the Hand” were reprinted with permission from pages 124-128 of “Stomp Rockets, Catapults, and Kaleidoscopes: 30+ Amazing Science Projects You Can Build for Less Than $1” by, Curt Gabrielson and the City of Watsonville (Chicago Review Press, 2008). Please check out a copy of “Stomp Rockets, Catapults, and Kaleidoscopes: 30+ Amazing Science Projects You Can Build for Less Than $1″ by, Curt Gabrielson. It’s full of fantastic projects! Ideas for material substitutes and process changes are attributed to The Mount Prospect Public Library’s presentation at a LACONI YSS program in 2013. I’m eager to try this really cool activity with my tween STEM club! But I’m a bit confused on the supply list. 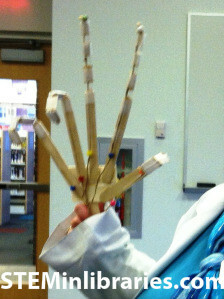 It says here that you only need 5 craft sticks per participant, but in the instructions link it says that AND 5 “proximal phalanges” (large pieces of a craft stick), 4 “intermediate phalanges” (medium pieces of a craft stick), and 5 “distal phalanges” (small pieces of a craft stick). How many craft sticks is that total per participant?